It’s a modern-breakthrough - so easy and effective, you only need it once a day. With Ultimate Defence Plus, you get nine of nature’s best prostrate protectors. Now, I know what you’re thinking – “But is that it? Are these all my choices”, right?Thankfully, you are NOT doomed to sleepless nights, running to the loo all the time and struggling to pee forever! ·And, beam with self-confidence because you’re finally in control of your life again! 8 POWERFUL nutrients working together to bring you COMPLETE prostate relief! We’ve combined this POWER of 8 into JUST TWO PILLS per day! They work, but there is something missing in them... Ultimate Prostate Defence has it, whatever itis... It just works better. Thanks a lot! This product contains NO wheat, gluten, milk/dairy, corn, sodium, sugar, starch, preservatives or flavouring. Discontinue use of this product at least two weeks prior to any surgical procedure. Use this product under the supervision of your healthcare practitioner if you are using blood thinning medication like warfarin. Always check with your physician before making any changes in diet or taking supplements. Ultimate Prostate Defence is excellent! 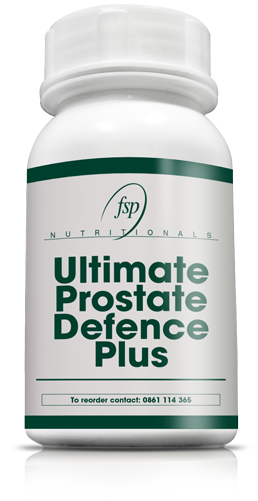 I have tried so many other products...They work, but there is something missing in them...Ultimate Prostate Defence has it, whatever it is... It just works better. Thanks Dr Alan Spreen! You will feel the results... OR GET YOUR MONEY BACK! We’re quite confident you’ll feel a difference – and it’s likely to continue even more as the months go by.Otherwise, just return the unused portion within 60 days for a full refund of the purchase price.